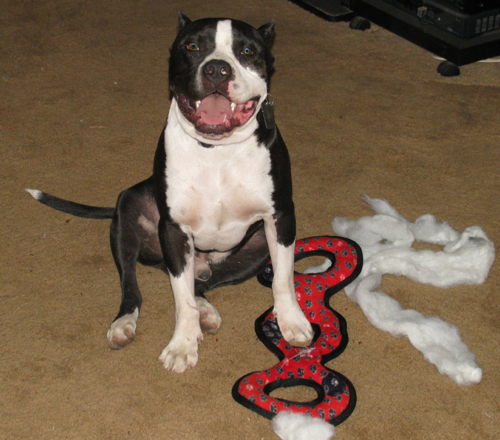 Pitbull lovers know that one of the characteristics of the breeds that make up the generic “pitbull” label is their fondness of chewing—hopefully their toys, and not our shoes, couches and the legs of dining room tables. They have powerful jaws, and we, as owners, search pet stores and online sites hoping we can find toys that will divert our friend’s gnawing urges away from our possessions and help them focus on to toys that will keep them engaged, and safe. I have two dogs, an 85 pound Amstaff (Walter) and a little 45 pound English Staffie (Piglet). Walter is a voracious chewer, who I’ve had for two years. Piglet is a new arrival and is learning quickly, from her new big brother, that chewing is fun. For the following toy trials, meet my main tester, Walter. Pictured here with one toy that obviously failed, within ten minutes. 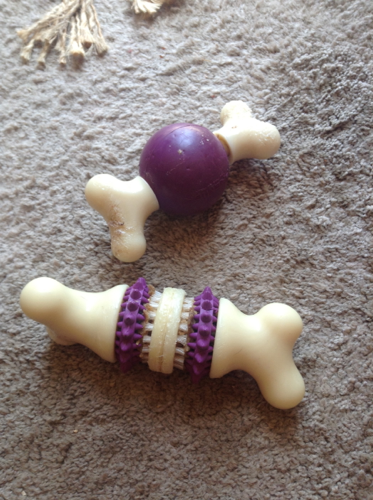 So here’s the problem: most pet toy manufacturers label toys suitable for aggressive chewers when in reality, they’re not. Some of these toys are actually alarmingly weak, and fall apart within minutes. Others are, in my view, so badly designed or made that they could actually become a choking danger. 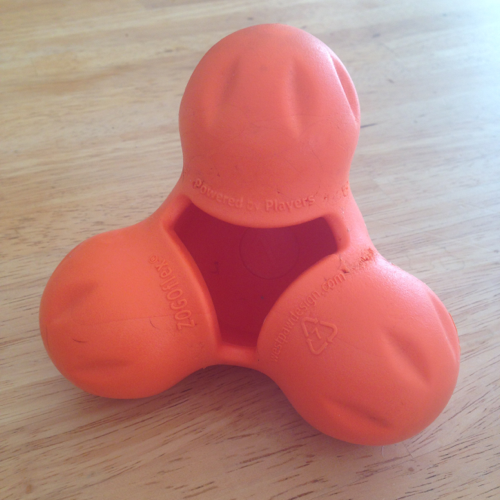 Of course, the pet toy makers cover their butts by stating “always supervise play” but we all know that dogs strew their toys all over the house and yard, and sometimes hide them, so we need to buy toys that aren’t going to be a hazard. From my own observations, here are some winners and losers. The best. Period. Most of their toys for aggressive chewers really last. 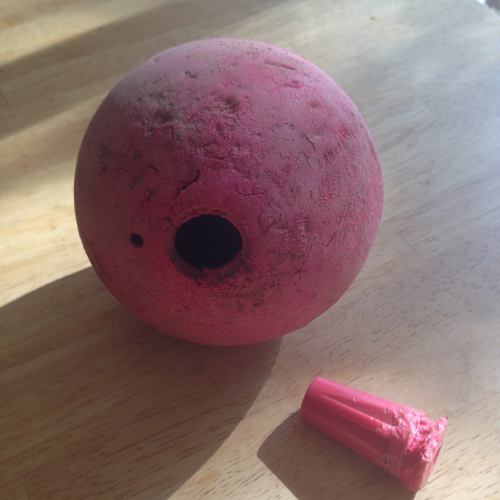 Here’s a 2 year old Jive ball; almost unmarked and Walter chases it around the yard almost daily. 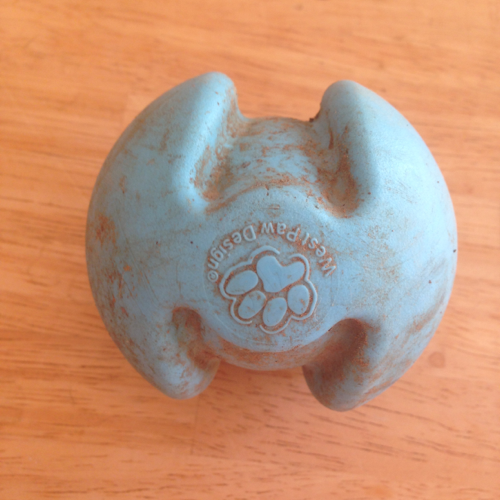 A bit grubby, but West Paw’s toys are dishwasher safe and clean up nicely. The Tux is as good and can be filled with cheese, peanut butter etc. for even more fun. 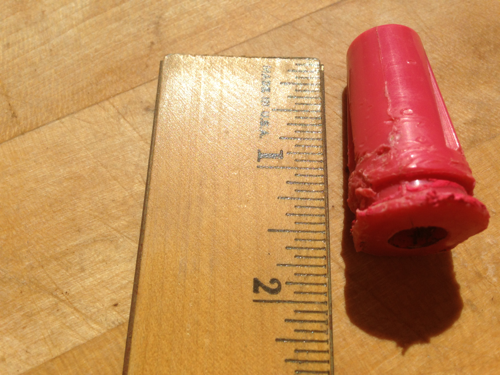 This one just came out of the dishwasher, and is almost unmarked after a year of play and chewing. West Paw also makes a Tizzi. This is one of Walter’s favorites, but isn’t as tough as West Paw’s toys shown above. Also stuffable, this would be a winner if a bigger, more durable version, was made. This one lasted only a day or two. Overall, a good toy, but has some drawbacks. 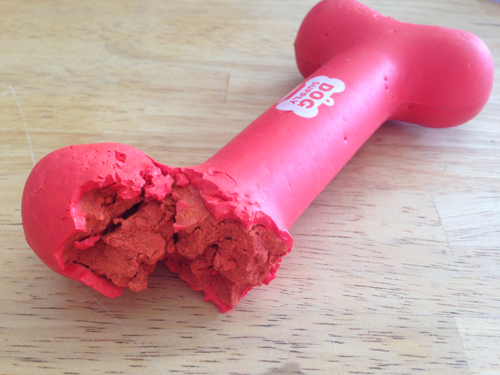 It keeps my dog’s interest, and is quite durable. Unfortunately, the pressed rawhide rings are expensive, and come in incredibly badly designed packaging that’s really irritating to open. With a bit of ingenuity, you can use cold cuts as treats and forget the replacement rings. 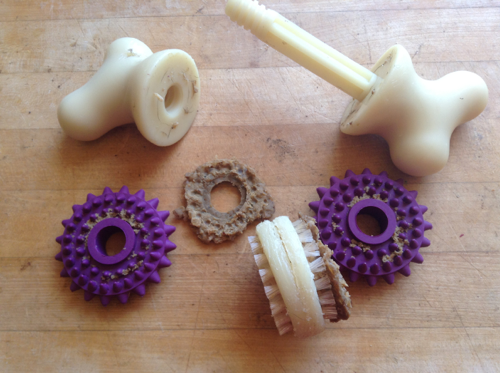 The toys unscrew so you can clean them, and replace treats. I found what Nylabone calls the “Dental PRO action.” Very tough, long lasting but not very exciting. Walter will chew on these, but loses interest unless I bump up the enticement factor with a smear of peanut butter. The toys pictured above are about 3 months old, and still holding up. These toys are great. Very tough and long lasting, and the versions I have are stuffable. The dirty examples shown below are over a year old and have held up well. Thankfully, they are also dishwasher safe. They’re a bit expensive, and for some reason my dogs don’t like them as much as West Paw’s toys, but your dog might. 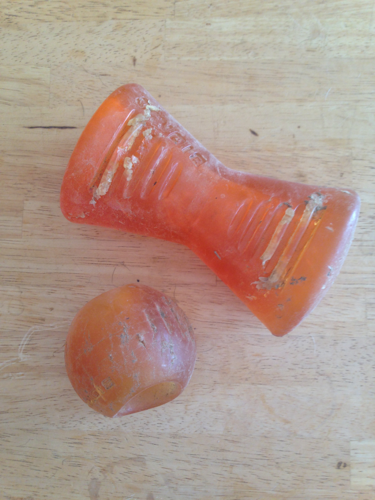 My dogs simply don’t like Kong toys. 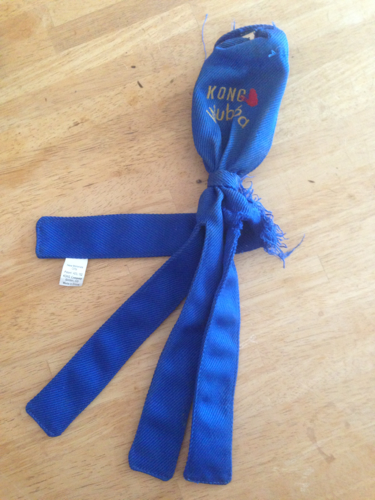 They’re supposed to be very tough, and the main Kong toy is supposed to be very resistant to aggressive chewers. Walter destroys them within minutes, and then loses interest and won’t go near them again. 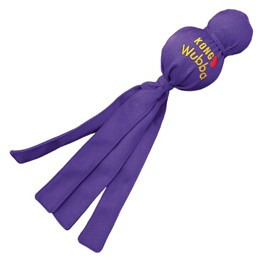 But the Kong Wubba is a different story. This toy is the clear winner for entertainment value. It can be squeaked, tugged, shaken and thrown. Alas, it doesn’t last, but for some reason Walter still loves it even after he’s removed the two balls and the squeak, leaving only the canvas covering which he still possessively carries around, shaking and playing with it, and bringing to me wanting to play tug. 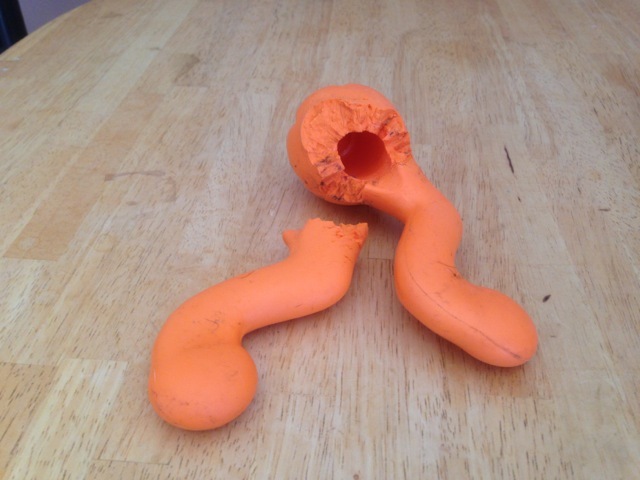 Here’s Walter’s last Wubba, after he’s destroyed it. Pitbulls need a “Super Wubba” which is much stronger. It would then be the king of toys. Walter likes these toys, but I don’t buy them anymore. They squeak loudly, which Walter likes, but they don’t last. Of more concern to me is that the squeak is easily removable, and as it’s a hard plastic item more than an inch long, I’m concerned this could be a choking hazard. Here are the pieces of one toy. I’d suggest you avoid these toys. Also beware of their iSqueak dog bone—same problem. I emailed JW about this fault, and they were kind enough to send a supposedly tougher toy (something that looked like a bowling pin), but unfortunately that didn’t last either. A well-meaning friend gave Walter a toy for his birthday. Bought from an Old Navy store, this thing is pictured below. AVOID THIS TOY! It feels really heavy, and robust. But within 10 minutes, Walter had chewed off, and swallowed, the end, and the internal material is made of something that just crumbles. Walter threw up a couple of times, but fortunately there were no serious side effects. 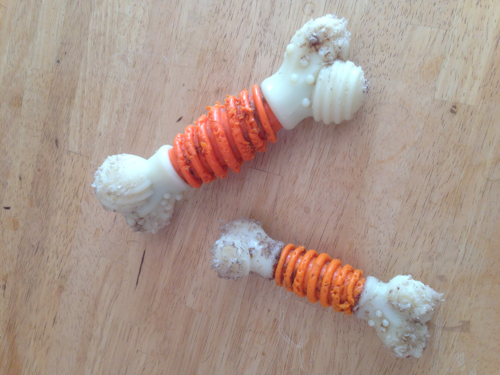 If I come across any more badly made or designed dog toys, I’ll add to this post. It’s really a great and helpful piece of information. I am happy that you shared this helpful info with us.